This event commemorates the upcoming National Rebuilding Day. Volunteer team captains attend to pick-up their team t-shirts and join dozens of other volunteers to spread excitement about the Saturday day of service. 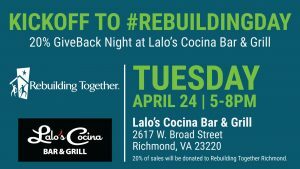 Lalo’s Cocina will donate 20 percent of its sales to Rebuilding Together Richmond.